This handy sharpener keeps both jumbo and slim pencils sharpened for perfect application. With more than two decades as a senior beauty executive, Sylvie Chantecaille joined forces with daughter Olivia in 1997 to form Chantecaille Beauté. Today, the luxury cosmetics line is recognized worldwide for its technologically advanced skincare and beauty products featuring high concentrations of pure, natural botanicals that nourish and revitalize the skin. Husband Olivier and daughter Alex are now also vital parts of the company. 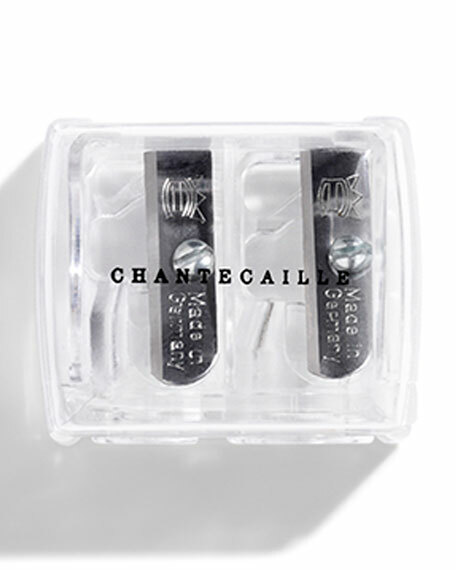 This high-quality jumbo eye pencil sharpener features a stainless steel blade that won't damage or waste your pencils. Can be used with our PlayOn Lip Crayon, Double Dazzle Highlighter Pencil and White/Pink Highlighter Pencil. Suggested use: Easily sharpen jumbo lip and eye makeup pencils to create defined lines.